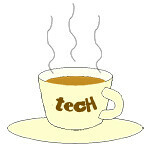 Optimus « Tech bytes for tea? LG has launched the Optimus G in Seoul, Korea today. Available in Korea next week and in key global markets in October. The Optimus G is LG’s new flagship smartphone model, with 1.5 GHz Quad-core Qualcomm Snapdragon S4 Pro processor. * In certain markets, the phone could be shipped with an 8 MP camera. The Android 4.0.4 (Ice Cream Sandwich) phone has a camera that shoots an amazing 13 megapixels while the sealed battery is rated at 2,100 mAh. 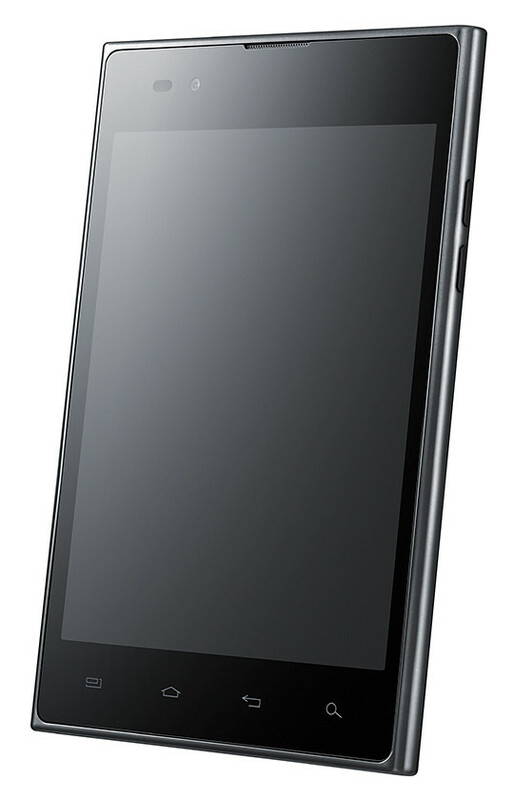 The Optimus G has a 4.7-inch WXGA True HD IPS Plus (1280 x 768 pixels) screen and is only 8.45mm thin. It is both LTE and NFC capable. LG’s new flagship smartphone leverages the powerful 1.5 GHz Quad-core Qualcomm Snapdragon S4 Pro CPU to provide speedy performance and a sleek user experience. LG boasts that the Optimus G goes beyond multi-taking into “cross-tasking” of activities without limitations. According to LG: whereas multi-tasking applies to running various applications at the same time, cross-tasking applies to complex tasks that can be completed simultaneously without having to compromise other tasks. Some new UX features that will be included into the Optimus G to showcase its cross-tasking and engaging capabilities are listed below. The Optimus Vu: will have the 4-PLUS-1 NVIDIA Tegra 3 Quad-Core processor and Android 4.0 (ICS) OS when the 5-inch smartphone heads out of Korea and Japan to make its global debut in September. The LG Optimus Vu: comes with a 5-inch, 4:3 ration IPS display. I last wrote about the LG Optimus Vu: half a year ago in February, when it was unveiled ahead of MWC 2012, and slotted to be introduced in Korea in March. At that time, it only had a 1.5GHz dual-core processor and Android 2.3 Gingerbread OS. The Optimus Vu: will be updated with a 4-PLUS-1 NVIDIA Tegra 3 Quad-Core processor and Android 4.0 (Ice Cream Sandwich) OS. It will also feature upgraded versions of QuickMemo and Notebook. Since then, more than 500,000 units of the Optimus Vu: has been sold in Korea while it has been launched in Japan this month. 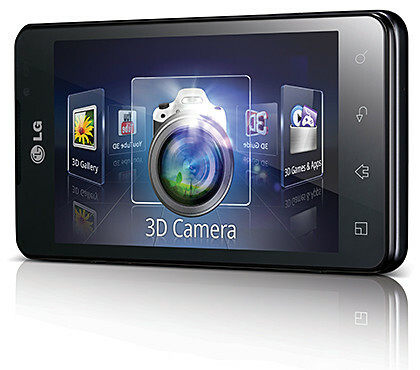 The LG Optimus Vu: sports a 5-inch display – slightly broader but smaller than the 5.3-inch Samsung GALAXY Note. The 4:3 ratio IPS display will work well with an upgraded version of QuickMemo and Notebook – two features that maximises the use of the large screen. The Optimus Vu: will make its debut in select markets in Europe, Asia (including Singapore), Middle East, Africa and Latin America in September. LG will debut its first Quad-Core smartphone in Singapore on 28 July. The Android 4.0 smartphone has an RRP of S$738 and comes with a free leather case, while stocks last. LG Optimus 4X HD Android smartphone, available on 28 July, 2012. The Optimus 4X HD runs on NVIDIA’s 4-PLUS-1 Quad-Core mobile processor – the Tegra 3. This is the same processor that is used in powerful tablet computers. The 1.5GHz Tegra 3 automatically activates all four cores when maximum power is needed but defaults to a fifth, battery-saver core when less power is required, such as during standby mode or music playback mode. The Optimus 4X HD has a large 4.7-inch IPS display with a high resolution of 1280 x 720 pixels, giving a high pixel density of 313 ppi. The 16:9 Stripe RGB IPS Panel offers sharper and crisper text. The smartphone also comes with a huge 2,150mAh battery. The LG Optimus 3.0 UI includes QuickMemo which lets users instantly jot memos or notes from any screen, without having to open a separate application. The smartphone also comes with MediaPlex, which combines a range of functions to enhance image and video playback such as Fingertip Seek and Live Zooming. MediaPlex also includes Time Catch Shot, which allows one to select and save the best shot among the images taken just before the shutter button is depressed. SingTel officially launches Singapore’s first 4G service for smartphones and reins in data usage by reducing 12GB data limit. Mr Yuen Kuan Moon, SingTel’s CEO Consumer Singapore briefing on the launch of the 4G services for smartphones. SingTel is also introducing new Flexi and iFlexi plans with reduced data bundles from 1 July 2012. SingTel had launched its LTE BroadBand on Mobile (BBoM) service for laptops via USB dongle in December last year. From tomorrow (5 June 2012), customers who purchase a 4G-enabled handset with a SingTel Flexi and iFlexi plan will be able to enjoy the 4G service. Three handsets will be available at launch: HTC One XL, LG Optimus LTE and Samsung Galaxy S2 LTE. SingTel’s 4G service will provide mobile Internet access that is up to five times faster than existing 3G-based smartphone services, with one-fifth of the network latency. “We need to break away from the traditional one-size-fits-all approach, which is not sustainable in the long term. Today, 64 per cent of mobile data on our network is consumed by 10 per cent of our subscribers. This prevents the remaining 90 per cent from enjoying the full benefits of the network. With our tiered pricing model, subscribers will pay for what they use, and this ultimately allows us to keep prices for our plans the same over time despite rising network costs,” explained Yuen Kuan Moon, SingTel’s CEO Consumer Singapore.Users can enjoy theoretical download speeds of up to 75Mbps and typical download speeds between 3.4Mbps and 12Mbps. SingTel will also introduce its Priority Pass traffic priority feature for the 4G service next year. This will provide subscribers with priority for their data traffic when the network is loaded, thus ensuring smoother streaming and downloads. Islandwide rollout of SingTel’s 4G network is expected to be completed in early 2013. In areas where 4G has not yet been deployed, users will fallback to 3G connectivity with download speeds of up to 42Mbps. Check the coverage diagrams at the end of this post to see when you will be enjoy LTE coverage. Data bundles for most of SingTel’s Flexi plans have been reduced drastically from 12GB to a range of 2GB to 12GB, although the number of bundled SMS has been increased. “At the same time, heavy users will benefit from the significantly reduced excess usage rates. Data traffic on our mobile networks has been growing at 62 percent each year since 2010 due to the tremendous growth of smartphones, tablets and mobile content. By encouraging fair usage of the network, we will be able to deliver consistently high-quality services for our customers,” Yuen said.Charges for data usage beyond bundled allowances have been revised to $5.35 per gigabyte from 1 July to 31 December 2013, and subsequently to $10.70/GB from 1 January 2013. Approximately 10 per cent of SingTel’s subscribers who are heavy SMS users will save from the new improved SMS bundles. The plans will be available to all new and re-contracting customers from 1 July 2012, and will replace existing 3G Flexi and iFlexi plans. So if you don’t want to relinquish the existing 12GB data bundle, you can let the existing contract run in perpetuity – but you’ll have to forego the handset subsidies that come with re-contracting. Mr Yuen noted that based on current usage patterns, 90 per cent of subscribers should not incur higher charges, as their data consumption does not exceed the new bundles. $5.35/GB (w GST) for 3G subscribers. Applicable to 4G subscribers during promotion from 1 July to 31 Dec 2013. $10.70/GB (w GST) from 1 Jan 2013 for 4G subscribers. SingTel claims that 90% of existing Flexi Lite use less than 2GB currently and hence will not be affected by the lowering of the data bundle from 12GB to 2GB. Likewise, 90% of current Flexi Value customers use less than 3GB, while 90% of current Flexi Plus customers use less than 4GB. Hence 90% of existing customers will not “suffer” from the data cutback – assuming their data usage remains unchanged. Read about StarHub’s response to SingTel’s launch below. 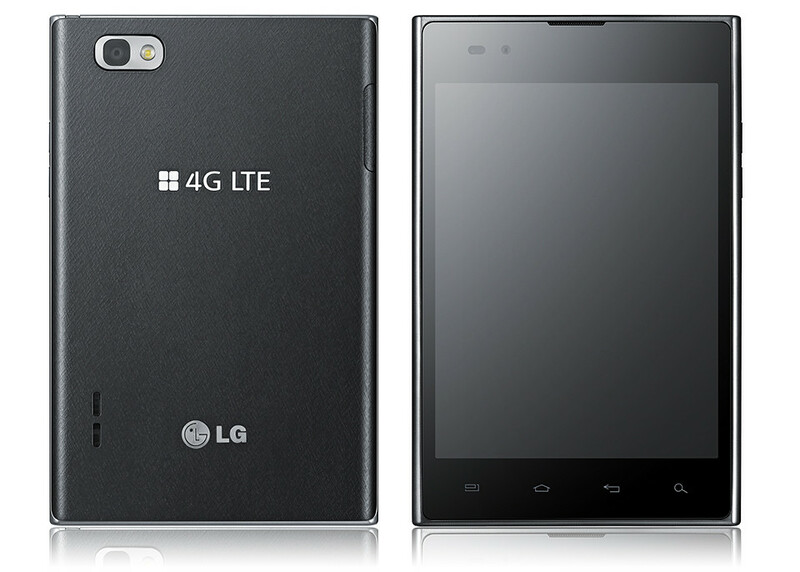 The 4G LTE smartphone from LG will be launched in Singapore on 7 June 2011. With an RRP of S$898 (without line), those interested can purchase it from SingTel at S$198, to start enjoying 4G speeds. LG Optimus True HD LTE will be available from 7 June at S$898 (without line) and S$298 with a SingTel contract. 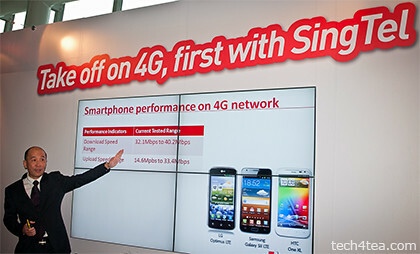 SingTel officially is launching its 4G services for smartphones in Singapore today. According to a 2011 report by Jefferies & Company, LG was listed as the global leader in LTE patents with ownership of 23 percent of approximately 1,400 LTE patents filed worldwide, with a financial value of almost USD 8 billion. LG demonstrated the world’s first LTE technology in 2007 and developed the world’s first LTE modem chipset in 2008. LG introduced the world’s fastest LTE technology in 2010 and conducted the world’s first video phone call on a LTE network in 2011. LG’s first LTE smartphone, Revolution, was launched in the US in early 2011. From tomorrow, customers who purchase a 4G-enabled handset with a SingTel Flexi and iFlexi plan can begin enjoying the 4G service. The LG Optimus True HD LTE (S$198) is one of three handsets available at launch. The other two 4G smartphones are the HTC One XL (S$318) and the Samsung GALAXY S II LTE (S$298). 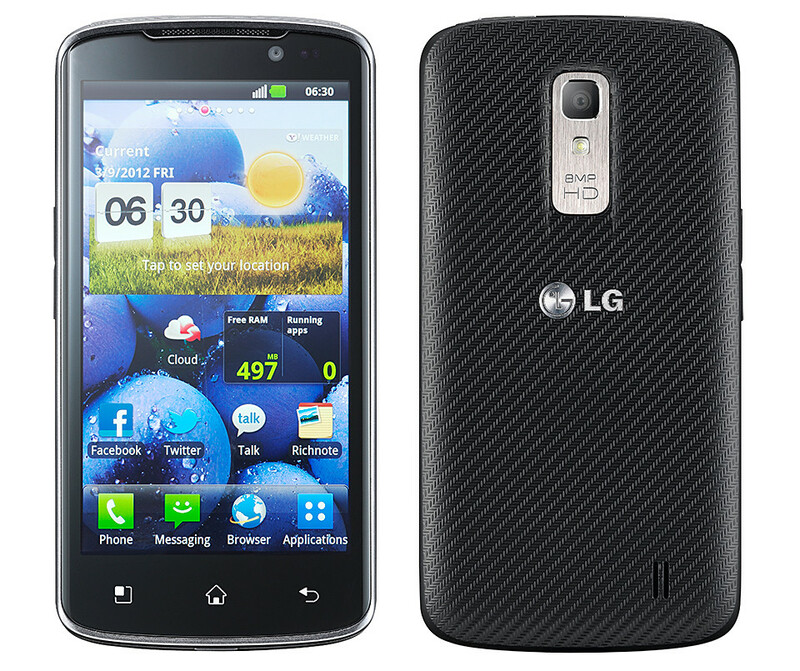 The LG Optimus True HD LTE has a 1.5 GHz dual-core processor, running on the Android 2.3 Gingerbread OS platform, which is upgradeable to the Android 2.4 Ice Cream Sandwich OS platform. The 4.5-inch 1280 x 720 (16:9 ration) True HD IPS display gives users sharp and crisp images with 2.76 million (1280 x 720 x 3 RGB) sub-pixels. “Singapore’s 4G LTE mobile networks are taking shape, making the arrival of the LG Optimus True HD LTE in Singapore timely,” said Mr. Scott Jung, Managing Director of LG Electronics Singapore.Content on the smartphone can also be shared through HDMI (High Definition Multimedia Interface) and DLNA (Digital Living Network Alliance). Each purchase of the LG Optimus True HD LTE will come with an Audio Technica headset worth S$168, while stocks last. The phone has a 1830mAH battery. The specifications of the LG Optimus True HD LTE can be viewed or downloaded below. LG’s new Optimus Max boasts both glasses-free 3D features and smartphone performance. The smartphone is available at all StarHub and M1 stores at S$698. Following last year’s 3D smartphone, LG Electronics Singapore has introduced the Optimus Max, which is only 9.6 mm thin and weighs 148 grams. The smartphone ships with Android 2.3 Gingerbread but will be upgraded to Android 4.0 Ice Cream Sandwich. Its 3G network speed has been improved to HSPA+ 21Mbps. Automatic setting changes create predefined tags that are customized to certain modes such as car-mode, office-mode or sleep-mode. Depending on location, the predefined tags will automatically adjust various phone settings including Wi-Fi, bluetooth, GPS and sound volume. HD Converter to offer HD quality on a TV connected through MHL (Mobile High-Definition Link), when transforming Open GL-based 2D games and applications to 3D and viewing Google Earth. Range Finder which calculates the distance between the camera and the subject as well as the dimensions of an object through triangulation. Out-focusing Shot which enhances camera quality beyond that of other smartphones through image processing using depth information. Icon Customizer which allows the creation of personalized icons. Images can be selected from the gallery and can be used as icons or shortcuts for a personalized look. Users can convert Google Earth, Google Maps and other road views into 3D using the enhanced 3D Converter. 3D photos and videos captured by the Optimus Max can also be viewed in a single-screen mode in 2D, using the 3D Hot Key mounted on the side of the phone to easily toggle between 2D and 3D. 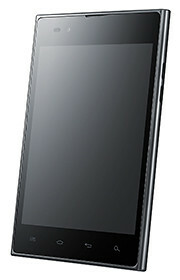 LG has unveiled the unique 4:3 ratio, 5-inch, LTE smartphone in anticipation of MWC 2012. It will be introduced in Korea in March and launched in Singapore in the last quarter of 2012. Optimus Vu: LTE Android smartphone from LG has a 5-inch IPS display and 4:3 ratio. The LG Optimus Vu: has an 5-inch IPS display, and offers a unique combination of tablet-like viewing with smartphone portability, similar to the Samsung Note. Running on a powerful 1.5GHz dual-core processor, 32GB internal memory and a large 2,080 mAh battery, the Optimus Vu: is suited for consuming multimedia on the go. The large 5-inch display with bright 4:3 aspect ratio makes viewing documents, books, Internet and multimedia contents easier and more comfortable. The 4:3 aspect ratio is optimized for viewing to grasp more at a glance and note taking to increase productivity in everyday life. 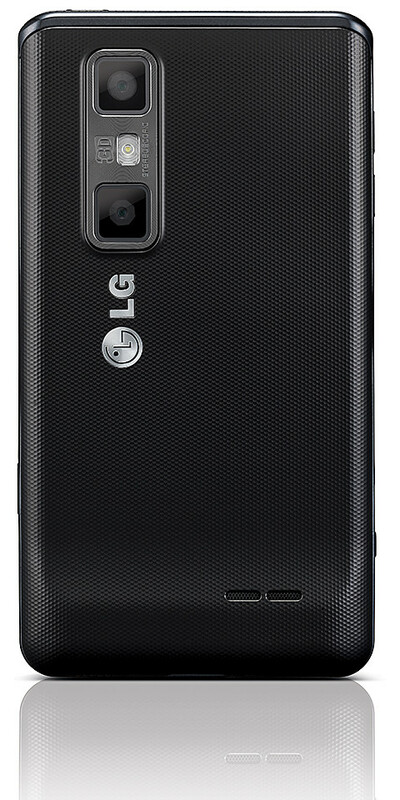 “The Optimus Vu: was designed to maximize what customers could do with a smartphone … by offering an optimal 4:3 ratio viewing experience, 5-inch display combined with superfast LTE technology,” said Dr. Jong-seok Park, President and CEO of LG Mobile Communications Company.The IPS display boasts natural color which can be viewed even under bright sunlight. Its unique built-in QuickClip hotkey allows users to conveniently capture screenshots and memos with a single push. Jotting notes is also possible with a finger or with the dedicated Rubberdium pen. Polaris Office is included to enable opening of documents, spreadsheets or presentations while on the road. The LG Optimus Vu: measures 139.6 x 90.4 x 8.5 mm. At only 8.5mm, the Optimus Vu: is the slimmest among all LTE phones currently on the market. Despite the large 2,080mAh battery, LG’s exclusive floating mass technology makes the Optimus Vu: appear slimmer than its actual dimensions. In addition to HDMI (High Definition Multimedia Interface) and DLNA (Digital Living Network Alliance), Optimus Vu: comes with 32GB memory and an 8-megapixel camera. While it will initially launch running Android 2.3 Gingerbread, an update to Android 4.0 Ice Cream Sandwich is in the works. Additional information on the unique Optimus Vu: can be found at the LG Stand in Hall 8 at the Mobile World Congress (MWC 2012) in Barcelona, Spain, from February 27 to March 1.